At M-Joy Cupcakes, we are fanatic about the future of the planet and how to make it a better place, not just for ourselves and our kids, but for all those other folks who share it with us. That's why we have created the We're giving back! ™ program. In this program, we influence anything that is in our power to do just that: to give back. Because happiness is only worthwhile when its shared. Whenever we can in our recipes, we chose to use natural and Bio certified products . Our dairy products (eggs, butter and milk) are all provided by a local creamery in Rhode-St-Genèse. Some of the sugars we use are unbleached, unrefined, and bio certified as well. 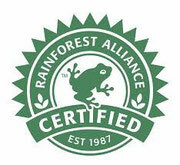 Our sugar is Fairtrade certified. Fairtrade is a trading partnership, based on interaction, transparency and respect, that seeks to generate greater equity in international trade. It contributes to sustainable development by offering better trading conditions to, and securing the rights of, marginalized producers and workers - especially in the South. All of our unsold cakes at the end of the day are distributed to the needy. We have a number of charities in the local community that take care of families, women, and children in need whom we support in this way, guaranteeing that none of our great cakes go to waste... By the way, if you are in any way associated with a charity that could benefit from our unsold cakes on a regular basis, please inquire within! M-Joy Cupcakes supports local initiatives such as the social grocery store in Waterloo. We at M-Joy Cupcakes don't use any plastic in our packaging. All of our cake boxes are made of recycled cardboard that is unbleached. Our cupcake cups are made of Scandinavian greaseproof paper, sourced from mills using raw materials from sustainably managed forests internationally accredited by the FSC (Forest Stewardship Council). All paper can be recycled and is biodegradable, and the inks used are water-based and environmentally friendly. 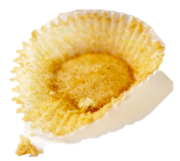 If you don't plan on carrying your cupcake home with you, and it is therefore for immediate consumption, please help us by saying "no thanks" to packaging. We'll serve it to you on a napkin. And the finger licking will be worth your while! Finally, our cupcakes are fully bio-degradable, and we do hope you'll help us in that process! ;-). These divine little individual portions of love are natural mood enhancers, and those who have come to savor them have been known to feel... extreme happiness. Every ingredient that goes into their making is selected with the highest attention to quality, taste, and authenticity. This is the real thing, and only that.